Known more commonly as “ringing of the ears,” tinnitus is a condition in which people experience sounds where there is no external stimulus. The American Tinnitus Association (ATA) estimates that millions of Americans “experience tinnitus, often to a debilitating degree, making it one of the most common health conditions in the country.” Approximately 15% of Americans – over 50 million people – experience tinnitus, whether it is temporary or chronic. Tinnitus has the potential to contribute to increased levels of stress, anxiety, and depression. Tinnitus has been linked to memory problems, the ability to concentrate, and fatigue. Tinnitus has been known to affect a person’s emotional well-being, interfering with social interaction and employment. Approximately 20 million Americans experience chronic tinnitus, with 2 million experiencing debilitating cases. In recent years, tinnitus has begun to receive much more attention and more dedicated research. The US Department of Defense has put millions of dollars into tinnitus research, due to a high number of Iraq and Afghanistan veterans suffering from tinnitus after exposure to the shocking, loud sounds of war. In most of these cases, veterans also suffered varying levels of hearing loss. Tinnitus comes in many different sounds, such as whistling, whooshing, clicking, hissing, or buzzing. There are two types of tinnitus: subjective and objective. With subjective tinnitus, only the person experiencing tinnitus can hear the sound. Because our bodies and nervous systems differ from person to person, these sounds take many diverse forms. Subjective tinnitus is the most common form, comprising 99% of reported cases. Causes of subjective tinnitus include sensorineural hearing loss due to damage of inner ear hair cells (aging, exposure to loud noise, and even certain classes of ototoxic medication); Meniere’s disease; impacted earwax; or another related medical condition. On the other hand, objective tinnitus creates a sound that can be heard by people who sit nearby. Objective tinnitus comprises less than 1% of cases, and has been linked to circulatory or somatic systems in the body. Objective tinnitus takes the form of pulsatile tinnitus, in which increased blood flow or muscle spasms affect hearing. In some cases, pulsatile tinnitus is synchronous with the beating of the heart. Other cases of pulsatile tinnitus indicate a problem with the small muscles of the middle ear or the bones of the inner ear. Conditions such as high blood pressure and others that affect blood flow may lead to objective tinnitus. In these cases, by treating related medical conditions, people may find relief from tinnitus. There is no cure for tinnitus, but there is effective treatment. Because the majority of tinnitus cases are linked with hearing, seeking a hearing exam and consultation with an audiologist might be the first step to finding a solution. If your tinnitus is linked with hearing loss, your audiologist will provide options for hearing aids that will address both issues. Hearing aids amplify sounds in your environment, and often times, increasing sounds will help with the internal roar of tinnitus. Most major hearing aid manufacturers offer a line of hearing aid products tailored to treating tinnitus: Widex Zen, Signia Primax, Siemens, and ReSound. Starkey Hearing Technologies, based in Minnesota, offers Multiflex Tinnitus Therapy in Muse, Halo 2 and SoundLens (Synergy) hearing aids. Multiflex Therapy creates comforting sound stimuluses that is customizable to soothe specific symptoms. Multiflex provides all-day relief, easy volume and memory adjustments, and re-training and masking options. Multiflex Tinnitus therapy is available in many different hearing aid styles: invisible-in-the-ear, completely-in-canal, in-the-canal, in-the-ear, receiver-in-canal, and behind-the-ear. Xino is Starkey’s standalone tinnitus treatment option. Siemens, a German manufacturer of hearing aids co-branded with Signia, offers tinnitus therapy through their BestSound Technology, available in both standalone devices or in Siemens hearing aids (Ace, Pure, Carat, Aquaris, Motion, Life, Insio, Nitro, and Orion). There are eight different sound therapy signals that are fully customizable to meet specific hearing needs. Synthetic signals include: white noise, pink noise, speech noise, and high-tone noise. Natural ocean wave sound therapy offers sandy beach, pebble beach, rocky beach, and boulder beach. Additionally, Siemens hearing aids give wearers the option to switch between modes from microphone only (no tinnitus sound) to tinnitus therapy signal only, to a combination of both with mixed mode. The Danish manufacturer Widex offers the Zen Tinnitus Therapy program, which is a comprehensive service to treat tinnitus. Zen Therapy consists of four parts: 1) Counseling: to educate and assist the limbic system to alter its negative interpretation of the tinnitus via cognitive and behavioral intervention; 2) Amplification: to stimulate the ears and brain and to prevent overcompensation; 3) Fractal tones: known as Zen Tones, delivered in a discreet and convenient manner, designed to both relax the wearer and provide acoustic stimulation; 4) Relaxation: a combination of behavioral exercises and sleep management strategies. Zen Therapy is available in a number of Widex hearing aids. 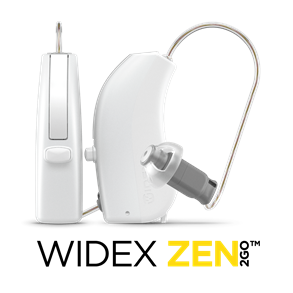 Additionally, Widex offers the Zen2Go, a standalone device for just tinnitus management. New from Sivantos and co-branded with Siemens, the Primax hearing offers tinnitus therapy in 9 channels: five in static noise and four in ocean waves. The Primax is designed to give wearers an easy listening experiencing, requiring less effort. Chockful of other great features to improve the listening experience, the Primax supports brain function in the process of hearing. With speech recognition features, special music models, and wireless connectivity, the enhanced experience of sound through the Primax works to mask the symptoms of tinnitus.